The Out Route - Mr. Pritchard Tear Down This Jersey! Mr. Pritchard Tear Down This Jersey! The first thing the Portland Trailblazers did after they drafted Greg Oden from Ohio State was put a huge Oden jersey, number one of course, on the side of the Rose Garden Arena. Now that Oden is out for the season with a knee injury he suffered when he "got up off the couch' a couch he was confined to due to his tonsillitis, the Blazers need to take the jersey down. It is embarrassing. It is embarrassing first to the city of Portland. The Blazers general manager was so giddy after the draft that he said that the drafting of Oden was "Bigger than the Rose garden, bigger than our organization, bigger than the city of Portland. The whole state and the whole area revolve on the Portland Trailblazers." What in the name of Lewis and Clark was he smoking after the draft? And now the city is left with this debacle, the latest in a line of LaRue Martin's, Bill Walton's and Sam Bowie's, isn't it now fair to say that this knee injury is the worst thing to happen to the region since Mount St. Helens blew her lid? Speaking of blowing lids, wouldn't it be nice to have Rasheed, J.R. and Bonzi back? At least then the fair citizens would be able to follow the police blotter as a source of amusement. 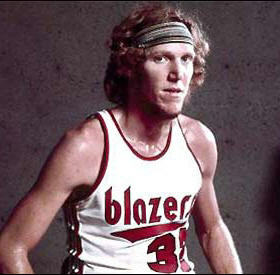 This whole sad affair is also, obviously, an embarrassment to the Blazer organization. Because the second pick in the draft, Kevin Durant, will be scoring plenty of points for the woeful enemies to the north- the Seattle Not-so-super Sonics. By the time the Blazers selected Oden it was anti-climatic despite the organization's silly "honk once for Oden, honk twice for Durant" billboard campaign prior to the draft. 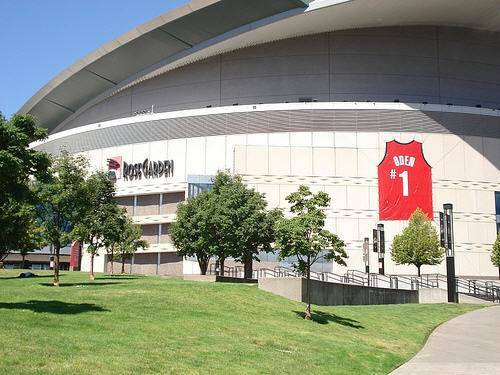 Now all that is left is the shadow of 'jinx' that hangs over Portland and the Blazers like the rain cloud that has not left since Walton left for the San Diego Clippers in 1978. The Blazer fans are embarrassed perhaps most of all because every Portland fan has a 'we are a small city but we try to act big time' chip on their shoulder. Who can really feel sorry for a bunch of people who deride Seattle at every opportunity and yet wear their Seahawks jerseys to work on Fridays because "there aren't any local teams." But the real reason they should take down that jersey is because it is embarrassing to Greg Oden. The kid, who is not yet 21--even though he looks older than Bill Russell--has to look at that thing and remember the hope that he instilled in a forlorn city for a few weeks. 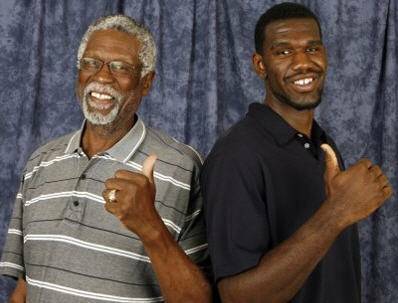 Greg Oden has not played a single game and he has let the city down, the organization down, the league down? Wow, what a burden. Give the young man some healing time, give us all some healing time, leaving a big huge emblem of dashed hope up for all to see is just too devastating to look at.